The Countryman EMW Omnidirectional Lavalier Microphone is designed to reproduce vocals, musical instruments, and ambient audio sources with pristine detail and minimal handling noise. The capsule is highly resistant to moisture, making it a suitable solution for outdoor use, placement against skin, etc. Clear audio reproduction with low rubbing and handling noise is a result of the EMW's omnidirectional polar pattern. The flat frequency response is well suited for capturing instruments and general vocals in stage performances, trade shows, houses-of-worship, auctions, lectures, and much more. A wide variety of colors and connectors are available for use with various wireless transmitters. This version is beige and features a 6-pin LEMO connector for use with Audio Limited wireless transmitters. The EMW lavalier microphone is available in three frequency response types. This version features a flat response for capturing vocals, various instruments, and ambiance. 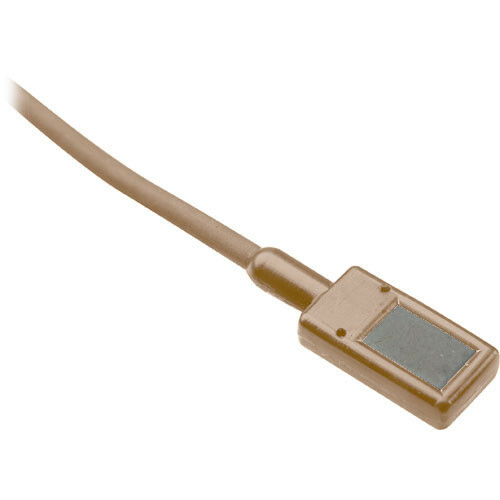 The square EMW lavalier is available in various colors that virtually render the entire microphone invisible against the skin, allowing you to select the version that is best suited for your application. The attached cable is made of durable, break-resistant Kevlar for rigorous use without shorts or wear. The EMW is credited with providing pristine audio with minimal handling and rubbing noise, due to its omnidirectional polar pattern. This square, moisture-resistant capsule is ideal for use in humid conditions, on skin, outdoors, etc.